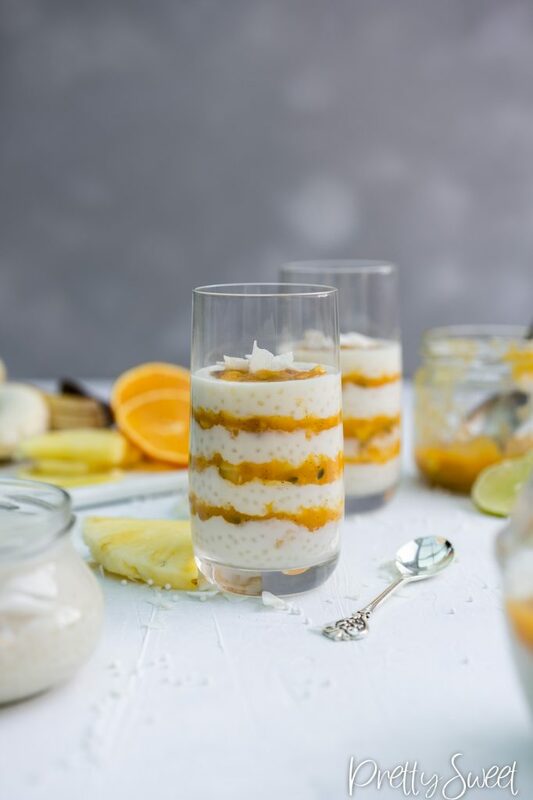 Creamy, Sweet Coconut Tapioca Pudding with Passion Sauce made of the best exotic fruits – passion fruit, mango, pineapple, banana, lime, lemon, orange and vanilla. The flavors and textures in this exotic tapioca dessert are like a dream that you just want to keep on dreaming. It’s seriously so good I can’t even stress it enough. Get ready to blow your taste buds away! If you don’t know what they are and what they can be used for, you are missing out! 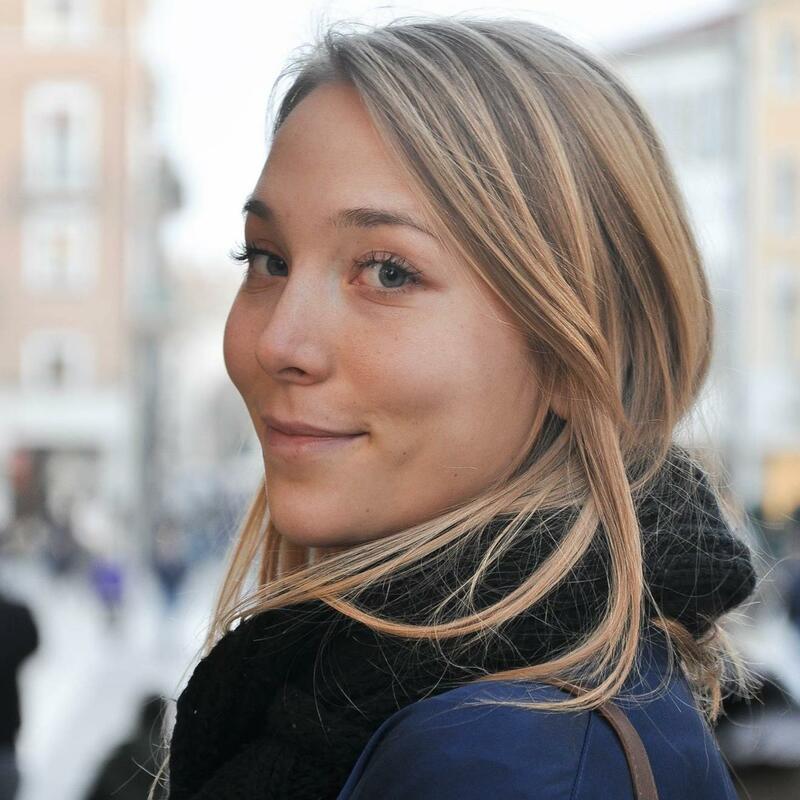 Don’t worry, I want to introduce them to you so that you will want to try them right away. So, what is tapioca? Tapioca pearls are essentially just a whole lot of starch extracted out of the cassava root (aka yucca) that grows mainly in South America and Africa. You can find tapioca in many forms, not only pearls. Maybe you’ve heard about tapioca flour or tapioca starch that is used as a thickening and strong gelling agent. Or maybe you’ve heard of bubble tea aka boba tea which is tea (green, black or other) with big tapioca pearls that is very fun to drink. Doesn’t chewing on sweet soft balls whilst drinking tea sound fun? Okay, maybe it sounds weird, but I love boba tea and it brings a smile to my face. It’s gluten free and as such super useful to those intolerant to gluten. It’s made out only of carbohydrates and doesn’t really offer any other nutritional value. You can find tapioca flour, flakes or tapioca pearls in various sizes. It has a neutral flavor and takes on any flavor you combine it with. Tapioca pearls are usually white but I’ve seen some green ones made with an addition of pandan flavor and color. It’s a great thickener and gelling agent. Okay, so, my coconut tapioca pudding is made out of small tapioca pearls cooked in coconut milk and whipping cream. An important thing to note here is which brand of tapioca pearls you are using because they differentiate in cooking time, soaking time and liquid to tapioca ratio. I’ve seen many people soaking tapioca pearls prior to cooking them but the ones I buy (the only ones I can get my hands on here, lol) don’t have to be soaked, in fact, they fall apart when soaked (yes, I’ve tried). So the first thing to do when you buy the tapioca pearls is to look at the packaging and see the cooking instructions. If it says to soak them, apply that to this recipe. 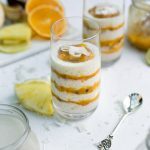 If you research tapioca pudding you will see there are many different cooking options but I’ve made mine a thousand time and for me, this is the way that works the best. I cook them for about 10 minutes until they get translucent with a bit of white in the middle. I found that cooking them for too long until they get translucent throughout, makes them kind of overcooked. The pearls will absorb any of the liquid you cook them in and plump up, even more so after a day in the fridge. This is why in my recipe I recommend cooking them the day before. 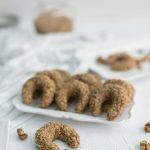 The next day they have a better texture and they will get thicker, so I usually thin them out with some milk if the consistency is too thick. This greatly depends on personal preference so make it as thick or thin as you want! 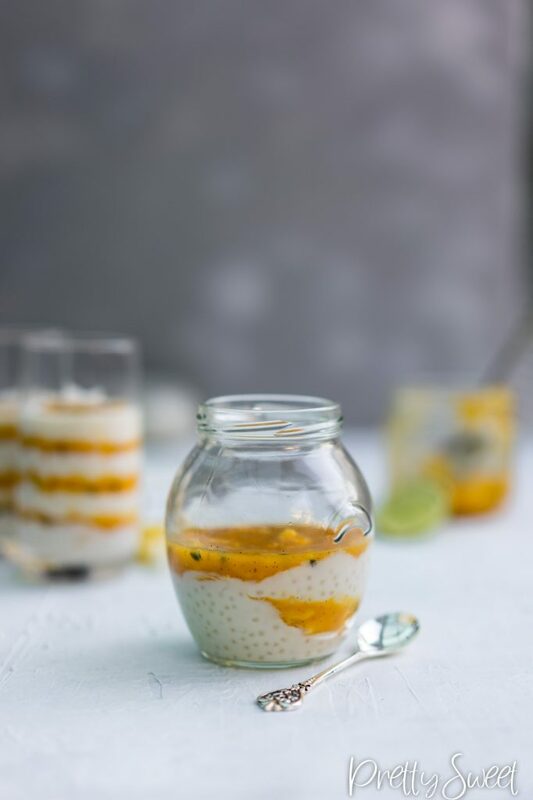 Tapioca pudding with or without egg yolks? 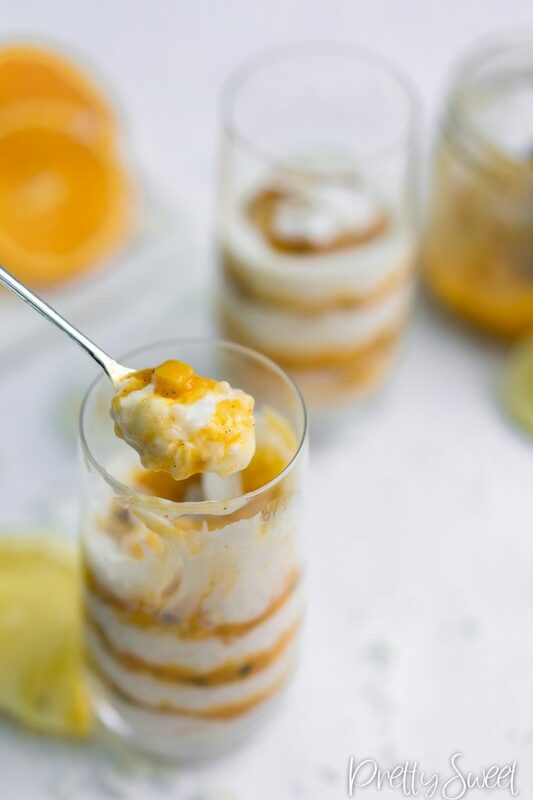 There are some recipes for tapioca pudding done with egg yolks, which is a more usual method for making puddings. But I’ve tried it and I think it doesn’t really need it. 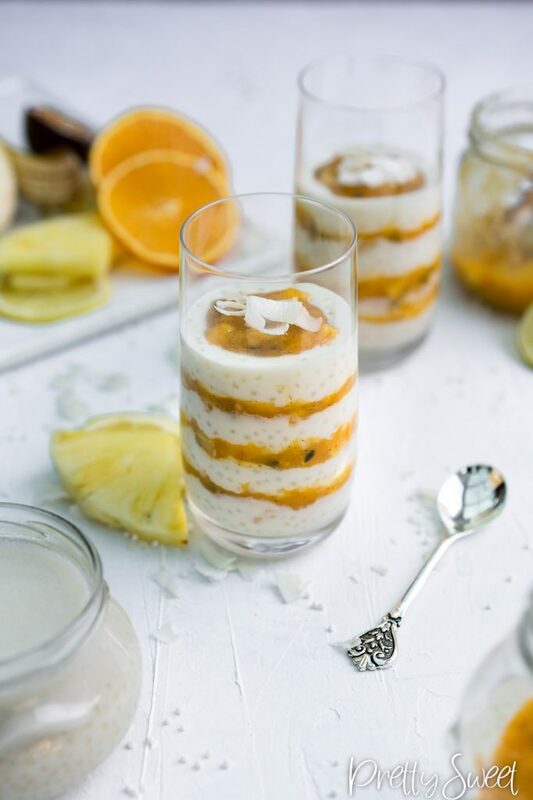 The tapioca pudding made of coconut milk and whipping cream is rich enough without the egg yolks and so we don’t need to add that additional step and ingredient. I would maybe use egg yolks if I was serving the tapioca pudding alone, without any sauce. 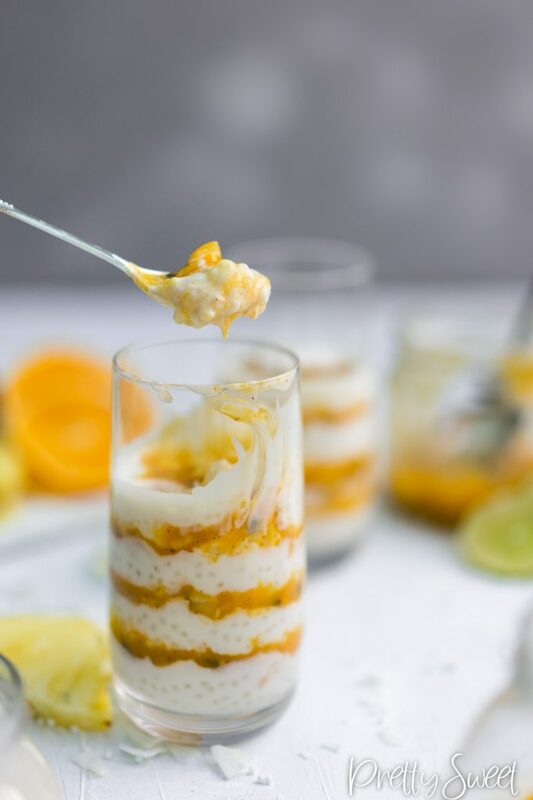 Using half coconut milk and half whipping cream makes a very rich and creamy tapioca pudding. You can substitute the whipping cream with milk or half milk half cream to make it lighter if you wish. Okay, I think we know something about tapioca now, right? What about this Passion Sauce? The passion sauce is made out of mango, passion fruit, pineapple, persimmon, banana, orange, lime, lemon and vanilla. The taste will transport you to a warm beautiful exotic beach, it’s so good. IT’S SO GOOD. Ugh, sorry, I would give you a sample to try but because I can’t, make the recipe and see for yourself! It would also work wonders on my Pavlova, which already has exotic toppings but both versions work incredibly well. I used persimmon because it’s in season and it adds some body and a nice sweetness. If you can’t get a hold of persimmon or don’t want to use it, replace it with the same quantity of mango puree. 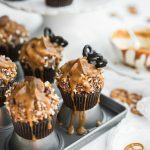 You may have to adjust the sweetness of the sauce with sugar if the fruits you are using aren’t sweet enough. 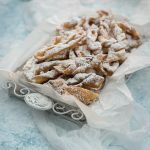 Of course for the best results, you should follow the recipe but I know sometimes we can’t get a hold of certain fruits, so you can maybe skip the vanilla or orange juice etc. Don’t like lemons? Use more lime instead. I used passion fruit seeds because I like their crunch. If you don’t like them, discard them and use the pulp. The mango and persimmon are pureed to make the body of the sauce. Pineapple and the banana are cut to small pieces to give the passion sauce some bite. I heated the sauce only to melt the sugar and to evaporate some liquid and make it thicker. Adjust how liquid the sauce is to your preferences. The ratio of the coconut tapioca pudding to passion sauce is also a personal preference, so adjust it to your liking. As you can see there is a lot you can modify with this recipe but that’s because it’s one of those that it’s so easily adjustable. In a cake you can’t have each guest decide their own cake to frosting ratio, here you can! I promise this is a dessert that people are first confused about and don’t know what to think because they’ve never heard of tapioca and are skeptical. Step 2: they try it, look funny and think about what those little funny balls are. Step 3 is usually them realizing it’s delicious and going ”Mm, that’s actually really good!”. 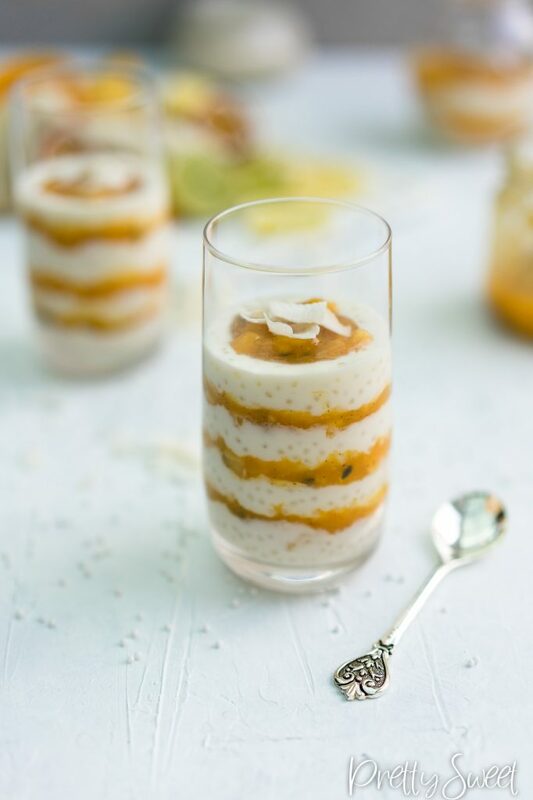 So, impress your guests (or yourself) with one of the best desserts – coconut tapioca pudding with passion sauce. Here is the recipe! Boil together the coconut milk, whipping cream and sugar. Then add tapioca pearls and cook for about 10 minutes on medium heat, or until the pearls are translucent with a bit of white in the middle. Stir constantly. Remove from heat and mix in the vanilla extract. Leave to cool. Combine all ingredients and cook for about 5 minutes to remove some liquid and make it a bit thicker. Be careful not to smash the chopped fruit. Let it cool. You can eat the tapioca pudding right away but I suggest leaving it in the fridge for the night. The next day the pearls will be plumper and the pudding will be thicker. Add some milk to make it to your preferred consistency. 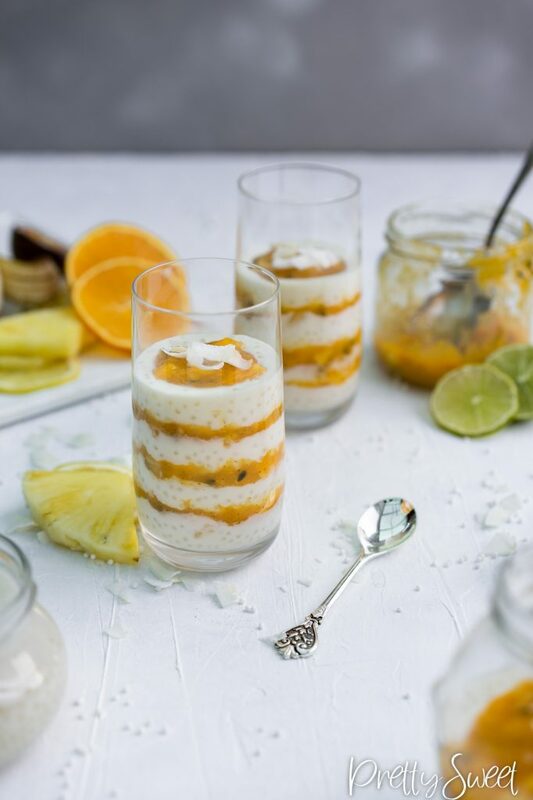 Take some coconut tapioca pudding, top it with the passion sauce and serve at room temperature. Use half milk half cream or only milk instead of whipping cream to make the pudding a bit lighter. 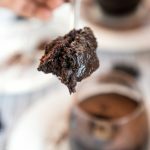 Reduce or increase the sugar amount to your sweetness preference. For a healthier version use other healthier sweetener by choice instead of sugar. If your fruit is not sweet enough, add some sugar to the sauce. Discard the passion fruit seeds if you don’t like them and only use the pulp. 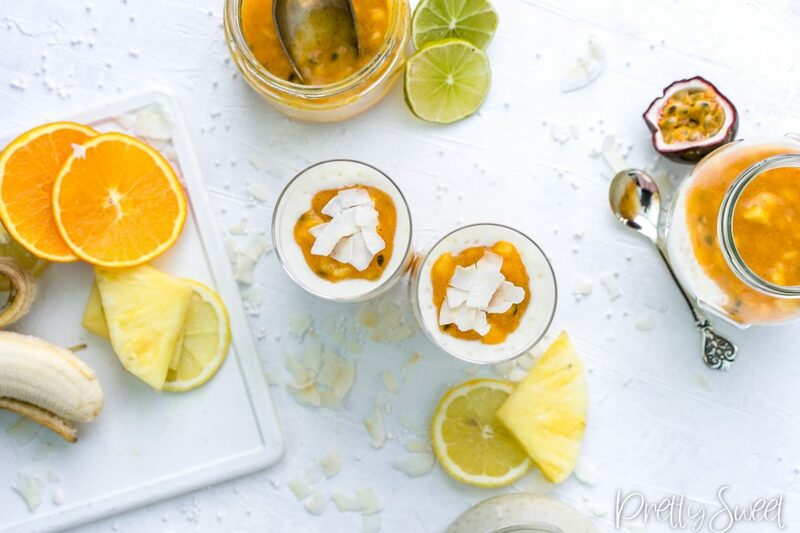 You can use mango puree instead of persimmon.